Brian Peters has the weekend forecast for Alabama from Alabama NewsCenter on Vimeo. DRYING OUT: The rain gauge at my house has been quite lucky the last several days. So far for August, I’ve recorded 3.22 inches of rain while the Birmingham Shuttlesworth International Airport has seen only 1.32 inches. In fact, the storm that prompted a severe thunderstorm warning Friday evening for portions of Shelby County dropped nine-tenths of an inch of rain in about 45 minutes. 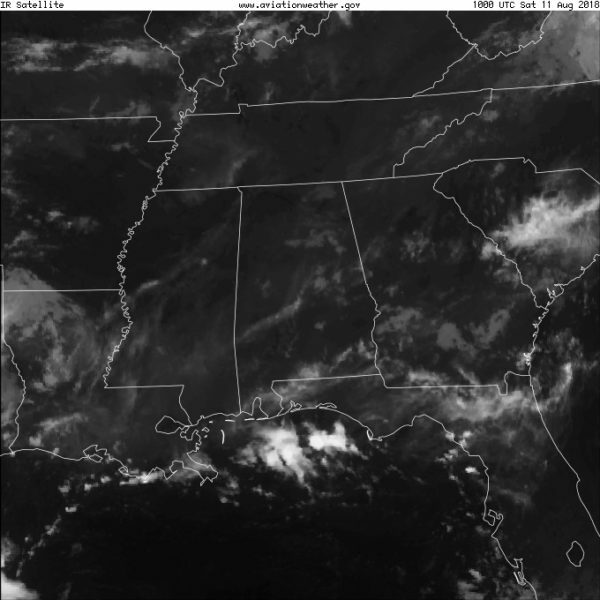 Some clouds streak the Alabama sky this morning, with fog also occurring across the northern half of the state. There were no fog advisories in Alabama, and fog should burn off between 8 and 9 a.m. The sky will be partly cloudy today with much lowered chances for rain, thanks in part to the deep moisture being pushed into south Alabama. I expect to see a high today around 90. NEXT WEEK: An upper trough with a closed low just south of the eastern Great Lakes will remain in place through Tuesday, so look for only small chances for rain. Highs through the first of the week will be in the lower 90s. Wednesday an upper ridge will move by, followed quickly by a short-wave trough that drags a weak front into the Southeast. Highs Wednesday remain in the lower 90s, but with the front present in our area for the end of the week, I expect to see chances for rain bump up just a bit while the additional clouds and showers help to keep high temperatures near 90. Rainfall during the next five days will be at a minimum, with lowered probability for showers and storms. You can see on the Quantitative Precipitation Forecast chart the relative minimum over the northern half of Alabama through Thursday morning. LONG TERM: Looking into voodoo country, the Global Forecast System maintains a trough along the Mississippi River through Aug. 20, but brings the Bermuda High into the Southeast by Aug. 22. This suggests the potential for at least a couple of fairly warm days. But the upper ridge is beaten back into the Atlantic by Aug. 25 as a broad upper trough moves into the western Great Lakes, reducing the potential of any excessive heat. TROPICS: A low-latitude tropical wave is in the Atlantic between the Lesser Antilles and the coast of Africa, and is expected to continue moving westward. The National Hurricane Center gives it only a 10 percent chance of developing over the next 48 hours because of dry air and cool sea-surface temperatures. The rest of the Atlantic basin is quiet, including the Gulf of Mexico.